I'm using the NES Gradius for reference, but fall back on the arcade version for some things. One thing I don't like in shmups are busy backgrounds, so I'd like to go for a rather dark featureless nebula motif. The bullets should be crisp without much glow. I think grow is a cheesy look-good effect which hurts readability. It's easier to notice animated and flashing stuff, so most enemy bullets could be rotating red elipses which also strobe a bit. The player generally knows where he's shooting, so the player bullets can be a light-gray-blue and without animation so they don't attract too much attention. The Options could also be blueish (they're red in the NES version). I like the simple flat colors of the NES version. With such a limited palette, you almost have to go for a simple light-shadow solution. As hardware evolved and artists got more colors, many fell into the trap of doing gradiation and texture just because they could. It's an easy trap to fall into for a painter as well. It would be fun with little choplifter people that could be stomped on. 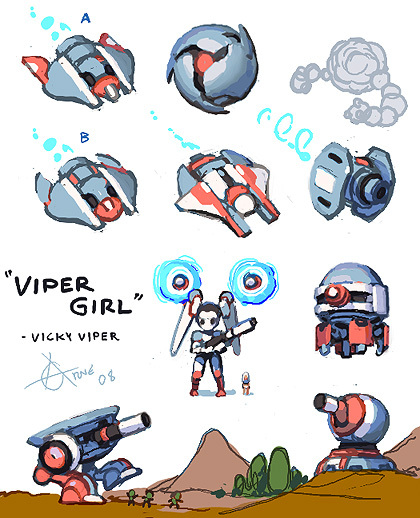 The pigtails on the girl mech are intended to mimic the double thingies on the Vic Viper. I desaturated the cyan on the ships (from the NES palette). I also used the Arcade version for reference, and it's rather drab in comparison to the NES version. But why did I desaturate the cyan? Well, I felt that the two saturated colors competed too much, and a metal gray would tie the ships to a familiar material color. Perhaps, to compensate, the exhausts or something could be super cyan. The colors in the NES version (cyan and pink and white) might be shading with colored lights and not decor, but I tried to interpret the colors as 3 color decor to increase likeness. It's year 460 After the Gradian Expansion. The Gradian Empire is at peace. There has been no major wars in over 90 years. Some decades ago, a mysterious Macro-Bacterial life form had attempted an invasion, but proved to be technologically inferior to the highly advanced Gradians. A few simple unmanned Gradian ships destroyed most of the Bacterion battle fleet, and pushed back the residuum to a region of space which had been abandoned by the Gradians over a century ago. There, the Bacterion survivors found an abandoned Gradian ship factory from the old Terraklexx wars (336 A.G.E.). Unfortunately, the databanks of the factory had not been properly purged, and the Bacterion managed to extract a couple of ship designs. While these were over a century old, they did upgrade the arsenal of the Bacterion forces considerably. Even though the Bacterion invaders now posed a mild threat, the Gradian government decided not to intervene. There had been politically complex neutral-space treaties signed with the Huu & Terraklexx over what now is called "the Old and Forgotten Grounds". The treaty was rather simple actually, it just stated that everyone should stay away from that area of space, or they'd just end up fighting about it again. This is the region of space where the abandoned Gradian factory lie. 'Concerned individuals' of the Gradians, Huu and Terraklexx eventually arranged a meeting to find a way to circumvent the politically sensitive issue. Eventually a plan was formulated to deal with the Bacterions. A small fleet was dispatched under much secrecy. This fleet included a High-Potential class Gradian Battle Suit, a Huu Gate ship, and a Terraklexx Base Converter. The fleet quickly located an isolated small asteroid island. The Bacterion had been hard at work at the old Gradian factory, populating the entire region of space with mini bases and various drone ships. After a quick sweep, the fleet established a base of operations on the island. The Gradian Battle Suit is extremely upgradeable, but the parts can be very expensive. The plan is to gather Plasmoid credits to pay for the upgrades. 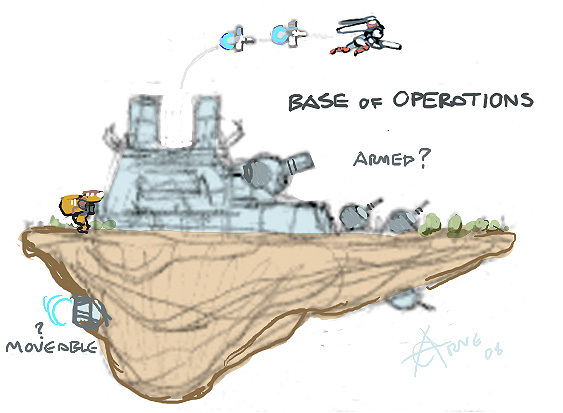 The upgrades will then be gated to the island so the Terraklexx mechanic can install them into the Gradian Battle Suit. This island serves to flesh out the setting a bit by providing a hime with a function. The player will return to this island to upgrade the ship, and maybe experience story segments. 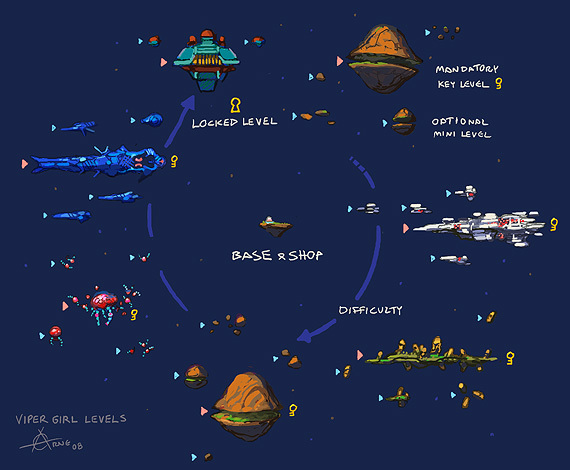 Burger asteroid - I think Gradius had a pretty good first level, because it used familiar elements such as brown dirt, green trees, etc. These worked as a soft introduction to the more outlandish things which came later. Gradian factory - Protected by the factory forcefield. Defeat the bosses of the previous levels to aquire the full key.... or something to that effect. There's no 'die and lose it all' mechanic, instead the player has only one life. 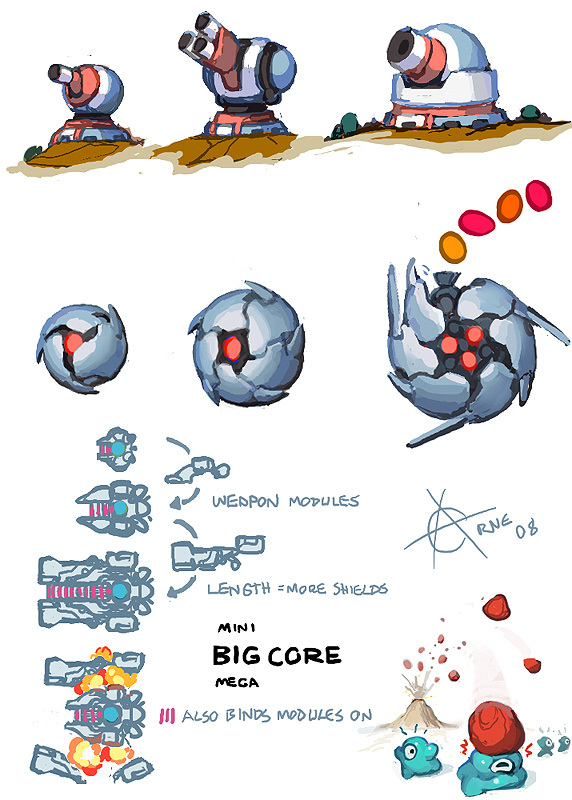 To compensate, there are shield hit points and a game mechanic revolving around replenishing those. Since the levels can be played in any order, dying can hopefully be less frustrating. Also, the game is rather short, but highly replayable with different weapon load outs. Each level takes about 2-3 minutes, and the mini levels are just a minute long or so. If a player really dislike a level he shouldn't be forced to play it. Therefore, there could be spare key fragments (2 keys, 3+3 fragments) hidden on some levels. One could be found by flying though the split mountain. Maybe a floating vector head appears and assembles/gives you a key, just to tie it in with the original where they appeared in the level warp corridor. There are never enough funds (¤) to max out everything. Since getting hit drains the shield points (which will have to be purchased), a skilled (or well upgraded) player who get hit less can spend more funds on upgrades. Table of number of ¤ in the game. Also, as a bonus at the end of the level, every 5000 points yields a ¤. enemies range from 100-300pts for grunts to 1000pts for larger stuff. A good end level score can be rewarded by extra ¤. Rather than making enemies more powerful (changing their behavior). 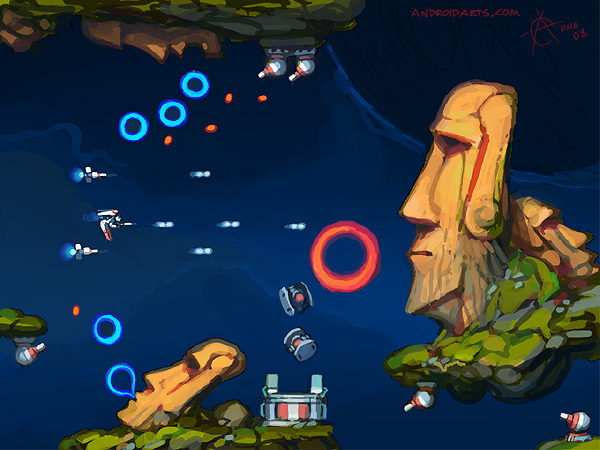 Each regular enemy could come in several graphically different versions. Medium - Your standard enemy which can take a few hits spray a few bullets. Elite - Shields and powerful weapons, almost like the player. The overall game difficulty level could be based on when the player arrives at the scene. I'd like a lot of range here, so Normal difficulty is preferable. Easy and Hard wouldn't be just slightly different versions of Normal. Easy would be for babies, and Hard would be for a select few. Early, Extremely Easy - Fewer enemies, and some types are missing. There are less ¤ plasmoid credits available because Normal mode should be the place where you get to pimp your ride. Late, Extremely Hard - The Bacterion forces have had time to build a lot of ships, a few new types, and a some experiments of their own. There are less ¤ plasmoid credits on the level, the way to get them could be by end level scaore bonuses. There are some bullet-hell enemies.